Pittsburgh was once known as the “Smoky City” or “Hell With the Lid Off” due to the overwhelmingly foul conditions that plagued it for over a century. Its geographic location and natural resource endowments made it an ideal home for the industries that inevitably created the pollution problem. The city’s dark past has been described as a cautionary tale for cities lacking environmental control. The rivers also became contaminated due to them being a popular transportation route and disposal location for sewage. 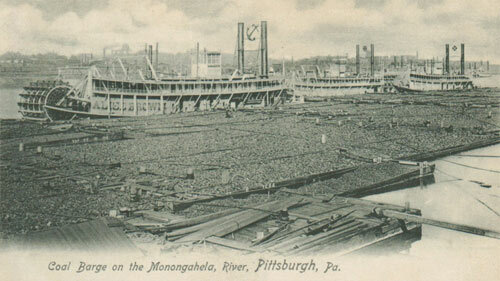 In 1880, Pittsburgh had hundreds of boats struggling to navigate the crowded rivers. The city had the highest typhoid fever mortality rate of any city in the nation between 1872 and 1908. An individual in Pittsburgh was three times more likely to die of typhoid fever than any other American at that time. Sewage discharge into the rivers was one of the contributing factors to the problem as this was also where the city drew its water supply. There were efforts made in the 1800s to reduce air pollution, but they were rarely enforced. Smoke control ordinances and the Bureau of Smoke Control were introduced, but not very successfully due to lack of proper regulations, enforcement, and control technologies. It was also very difficult to convince residents that the smoke was a problem. Many people felt the smoke was a sign of productivity and prosperity. They believed the smoke was good for their lungs and helped crops grow. 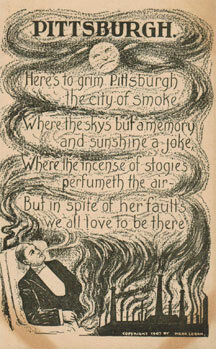 Pittsburgh’s dark haze inspired many poems and was an important part of the city’s identity. Lawrence felt passionate about cleaning up the city since he had grown up in a tough working-class Irish neighborhood in the Point by Fort Pitt. The neighborhood consisted of many run-down and abandoned steel mills and other old industrial buildings. He had lived among some of the worst impurities in the city and saw the need to improve conditions. After becoming mayor, he began what has been referred to as “Renaissance I” to clean up the city. The 20-year redevelopment effort included sandblasting the smoky grime off the city’s iconic skyscrapers and making transportation improvements. The city began enforcing smoke ordinances. The war effort exhausted many of the industries that were the source of the pollution problem, forcing them to be reassessed. The city began to improve dramatically as it found new sources of energy and other ways to provide jobs. Smoke pollution had seen a 90 percent decrease by 1954. A new sewage treatment plant, the area’s first two expressways, and an airport were constructed. Pittsburgh’s transformation during this time was unique because other cities were experiencing deterioration in their downtown areas as families moved away from cities and into the suburbs. Pittsburgh’s downtown was expanding and finding a new way to attract residents to the Golden Triangle. The collapse of the iron and steel industry during the 1980s had a significant impact on the air quality in Pittsburgh. During this time, the city was already going through an urban renewal with Renaissance II. This time around, the service industries were seeing significant growth. The city began to redevelop land previously used as industrial sites and saw a rise in commercial, retail, and residential districts. This also helped clear the skies to reveal the city’s beautiful skyline. Pittsburgh has changed over the past century like no other American city has. There are no longer any steel mills within city limits. It has emerged from the darkness of the steel industry and moved into the bright future of health care, education, technology, and financial services. The industries of the past have been replaced with technology and research companies like Google and RAND as well as global financial institutions like PNC and Highmark Insurance. Modern day Pittsburgh continues to make environmental improvements as it reshapes its identity from a dark and gloomy city of industry to a bright city on the cutting edge of technology and business. These changes in the economy have aided in the environmental transformation of the city and surrounding area. Pittsburgh ranks among the most livable cities in the world and often tops the list for the United States. The vision and promises of David Lawrence will continue to have positive and lasting effects on the city for years to come.